Charles Marchant Stevenson III was born to Mildred and Charles Marchant Stevenson on August 29, 1927 in Washington, DC. 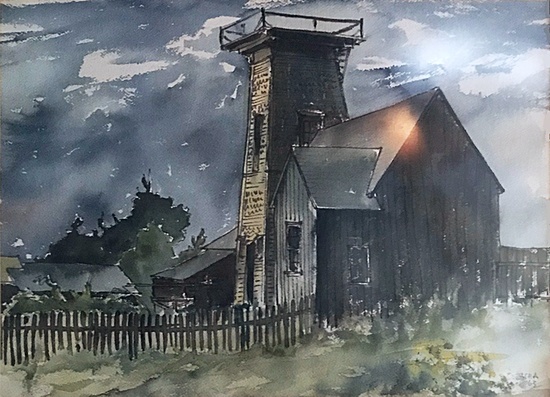 The Stevenson Studio at the Mendocino Art Center was the gift of the artist’s parents. “At ten years old I had a revelation of talent, and I won a scholarship to the adult school of the Corcoran Academy of Fine Art… It was an interesting experience, being a child, partaking in these adult classes. “We went to the National Museum in Washington, D.C., the Mellon Gallery and copied paintings…[Andrew William Mellon founded of the National Gallery of Art], and copied paintings… I copied an El Greco, The Virgin of Saint Tecla and Saint Inez, which is a very elongated, sinuous, flame-like brush stroke painting. 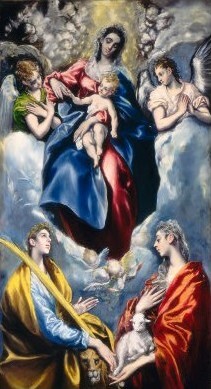 The Virgin of Saint Ines and Saint Tecla (El Greco). I was dissatisfied with the color, because I couldn’t get it as rich and luminous as the original. Then I met a man who was a professional copier, and he told me about glazing techniques. 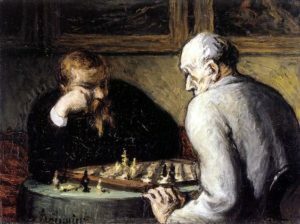 The Chess Players (Honoré Daumier). I was much more satisfied with my second painting, a copy of The Chess Players by Honoré Daumier, because I followed this man’s suggestions for glazing transparent colors over a gray or beige underpainting, as the old masters did. It was 1938 and I was eleven years old. In September 1945, immediately after his eighteenth birthday (8/29/1944), Stevenson enlisted in the United States Navy. His service assignments included work as illustrator for the morale magazine All Hands, art director for Training Bulletin, and editor of Naval Training. Sketch in a letter from Charles Marchant Stevenson to the girl back home (demobilization, 1945). Inscription: Home – Everyone, and everything goes home in the end. Courtesy of Nancy Todd. Thanks to the G.I. 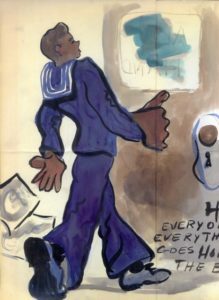 Bill (the Servicemen’s Readjustment Act of 1944), like many other veterans, Stevenson continued his education free of charge, attending the Pennsylvania Academy of Fine Art and the University of Pennsylvania, in Philadelphia. Two and a half years later Stevenson ended his formal education, and married briefly. He found work in a series of art-related jobs that were far from his dream of life as an artist, as an apprentice stained glass church window designer (Paine-Speyers factory) in Patterson, New Jersey, as an attendant and art therapist in a mental hospital in Hartford, Connecticut, and as an advertising artist for department stores in Dallas and New York City. Stevenson moved to San Francisco in 1954 to work for the commercial advertising agency Wyatt & Welsh. Two years later he was still in San Francisco, self-employed, and in demand as a muralist and portrait painter. 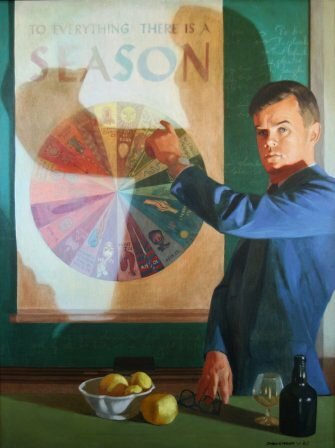 Seasons (1961). Portrait of friend and business partner Arnold Borley by Charles Marchant Stevenson. Oil on casein. Inscription: To everything there is a season. 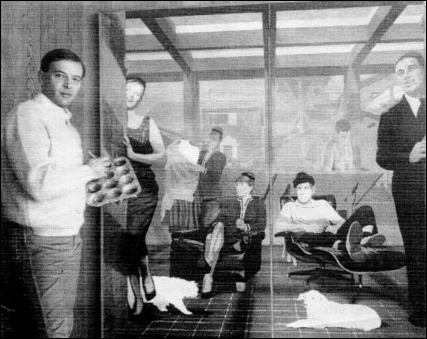 During Stevenson’s last four years in San Francisco, he was owner (in partnership with Arnold Borley), and president, of Stevenson Graphics, representing fifteen artists specializing in advertising art. The bare bones of Charles Marchant Stevenson’s life to this point conceal a cultured, gracious and generous man searching for the spiritual within the mundane. In 1961 Stevenson closed the San Francisco chapter of his life. 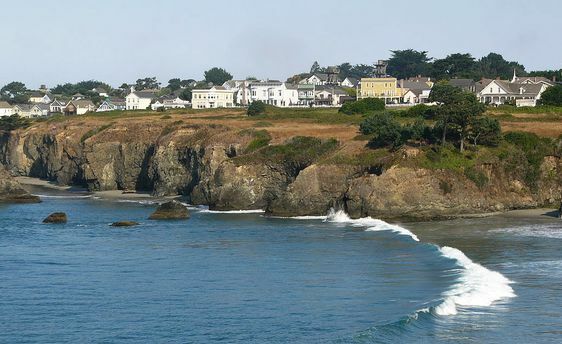 Looking north across Mendocino Bay toward the village of Mendocino . Photo by Jef Poskanzer. “I put everything in the back of my old Buick and came to this wonderland, and found that the rumors were a little off. The town was then pretty sad-seeming because half of the buildings were boarded up and almost every house in town needed paint or something done to it. Charles Marchant Stevenson with his double portrait of Jennie and Bill Zacha (1964). Acrylic on canvas. Photo: Bill Foote. On arriving in Mendocino, Stevenson phoned Dorr Bothwell, his only acquaintance in the town, whom he knew slightly from San Francisco metaphysical circles. 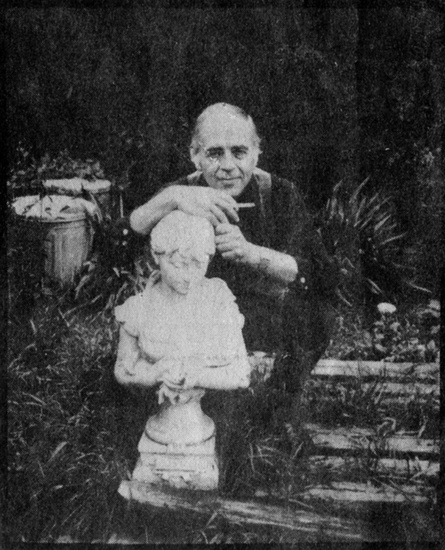 Bothwell invited Stevenson to her studio, then took him with her to dinner at the home of Mendocino Art Center founders Bill and Jennie Zacha. That night Zacha rented Stevenson a small place behind their house at 640 Little Lake Street, and gave him two weeks worth of architectural drafting work. Stevenson found part-time work at several local bars and restaurants, but even working a “Mendocino Bouquet” of jobs, Stevenson found himself unable to meet his rent. 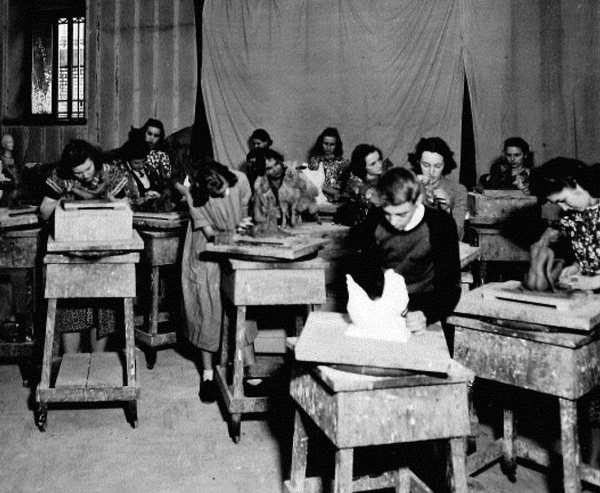 Then Bill Zacha offered Stevenson a job teaching at the Mendocino Art Center. 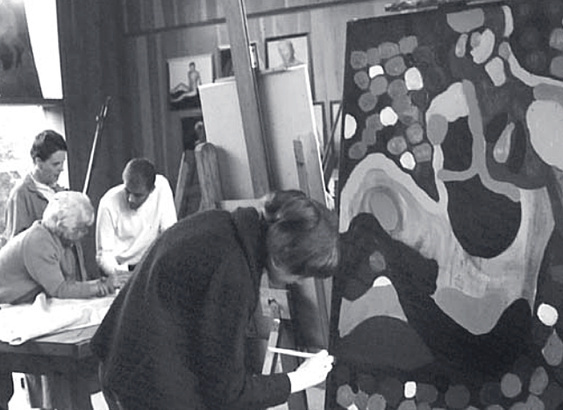 Charles Marchant Stevenson (center rear) in his studio at the Mendocino Art Center (1965). Photo by Bill Foote. Stevenson’s years of study at the Corcoran, and at the Pennsylvania Academy of Fine Art, the years of practical application of his skills, his creative vision, insight, enthusiasm, and personal warmth made him an especially inspiring teacher. He taught at the Mendocino Art Center for almost forty years, guiding generations of art students. 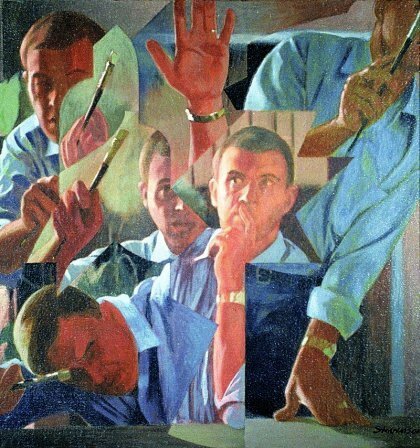 Charles Marchant Stevenson’s habits of precise observation, his understanding of history, his hermetic studies and use of sacred geometry in composition, and his warm humanity, all contribute to work filled with power, insight and impish humor. He is best known for his dynamic large-format portraits, usually painted in acrylics, often on a surface of gessoed cheesecloth on wood or masonite panels, but his subject matter is as varied as his many interests. 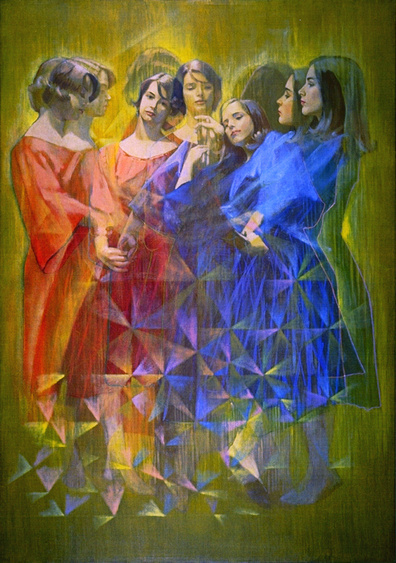 Dancers by Charles Marchant Stevenson (1969). Lolli Blydon or Charlotte Beeson, and Joan Marler. Acrylic. Stevenson’s large paintings are so eye-popping that art critics sometimes fail to mention his work in other media. Stevenson’s drawings, and watermedia paintings are smaller, but equally remarkable. 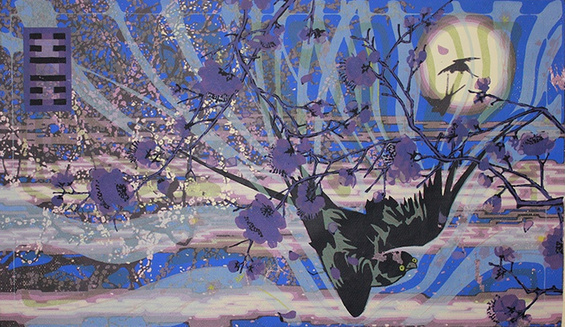 Stevenson’s serigraphs are brilliant. Stevenson, Anglican by birth, explored many philosophies and religions in his artwork. 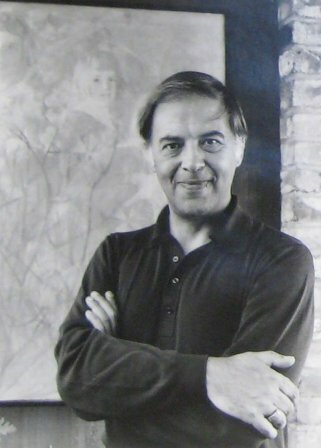 Charles Marchant Stevenson standing in front of his 1964 portrait of Lucia Zacha. Lucia Zacha by Charles Marchant Stevenson (1964). Acrylic. 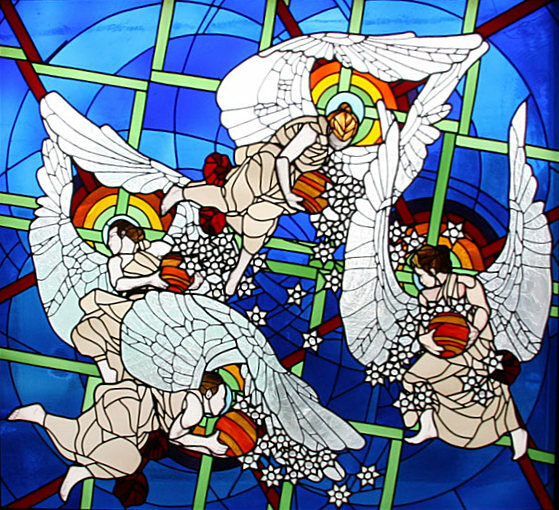 Between 1974 and 1984, Stevenson designed the magnificent stained glass Angel Windows at the Episcopal Church of Saint Michael’s and All Angels. Stained glass Angel Window by Charles Marchant Stevenson, at Saint Michael and All Angels Episcopal Church, 201 E. Fir Street, Fort Bragg California. Some consider Stevenson’s most important work to be the masterful suite of pen and ink drawings illustrating Chester Anderson’s sharply comic roman à clef, Fox & Hare: the story of a Friday evening. 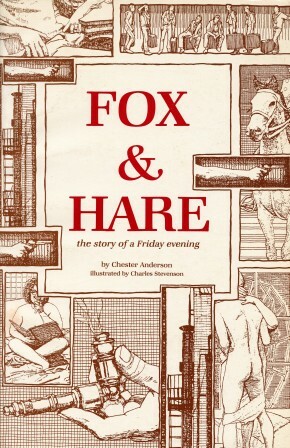 Fox & Hare: the story of a Friday evening. (1980) Written by Chester Anderson, and illustrated by Charles Marchant Stevenson. Cover of trade paperback edition. 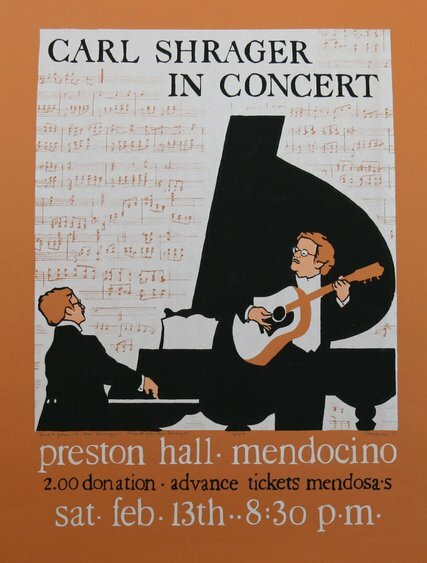 In 1989, while working on sets for the Gloriana Opera Company production of Peter Pan, Stevenson met gifted young Mendocino painter Matt Leach. Together they completed the sets for Peter Pan and designed a poster for the show. Leach had deep admiration and respect for Stevenson and his work; Stevenson saw something of himself in the creative energy and dedication of the younger artist. They continued their artistic collaboration and soon, at Stevenson’s invitation they formed Stevenson/Leach Studios (Paris, London, New York, Mendocino). Stevenson/Leach Studios produced spectacular work. The Stevenson/Leach series of large double-sided painted screens, include the award-winning Mendocino Afterglow. 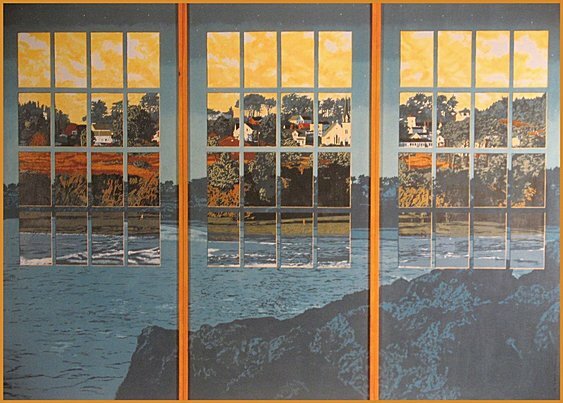 Mendocino Afterglow (1990). Three panel screen, painted in acrylics on both sides (80″ x 108″). Designed by Matt Leach, and executed by Matt Leach and Charles Marchant Stevenson, Stevenson Leach Studios. No single Mendocino gallery was large enough to hang a truly representative retrospective of Stevenson’s large body of work, so in August and September 1994, the Highlight Gallery and the Mendocino Art Center shared the presentation of The Charles M. Stevenson Retrospective. 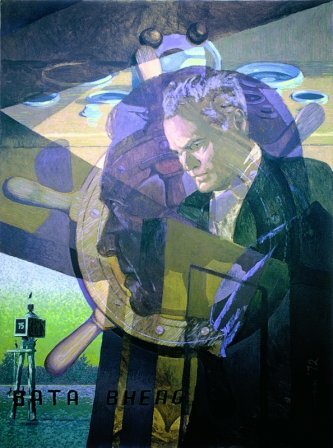 Bata Bheag: Portrait of Irving S. Shapiro by Charles Marchant Stevenson (1968). Acrylic on canvas. 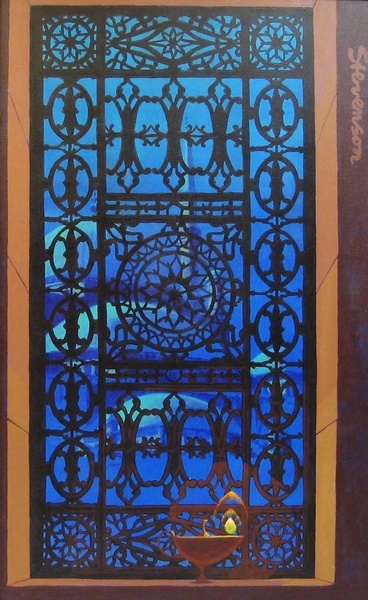 (24″ x 16″). Stevenson’s friends shared his dedication to community, and most shared his passion for the performing arts, which found expression onstage and off. He was a gifted actor, director, designer, and producer. In 1972 Stevenson produced and directed the musical fantasy Which Dreamed It? inspired by Alice in Wonderland and Alice Through the Looking Glass (Helen Schoeni Theatre at the Mendocino Art Center). Libretto by George Sanchez, and music by Carl Shrager, local treasures, and longtime Stevenson theatre accomplices. 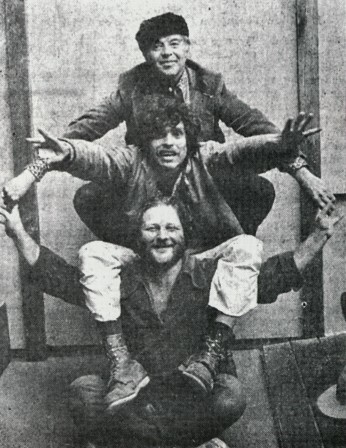 Bottom to top: Carl Shrager, George Sanchez, Charles Marchant Stevenson. Stevenson and his longtime companion Tom Burnham made the Art Center a spectacular gift of land in the heart of the village, with the stipulation that low-cost housing for artists be built on the property. That the Art Center was unable to fulfill the Stevenson/Burnham dream diminishes neither its beauty, nor the selfless example they set. Like his friends the Zachas, Charles Marchant Stevenson gave unstintingly to his community, his time, his talent, his resources, sponsoring exhibitions, concerts, and plays, and providing grants to local musicians and writers. 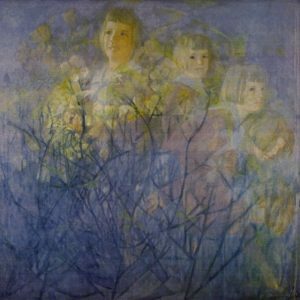 Charles Marchant Stevenson: It was my longtime dream to be part of a golden age of art. What happened in Mendocino gave us the feeling that we could influence the course of events by our dreams and our visions. The people who came helped complete our connection with the arts and I think we did have a golden age. Charles Marchant Stevenson helped create that golden age and in his last years, when Mendocino’s golden age was passing into myth, Stevenson reenvisioned it, willed it back into being long enough to awaken the dream in the hearts of a new generation. Aided by his close friend and biographer, the artist Pamela Hunter, in his later years, in failing health, Stevenson hosted a monthly Second Saturday Salon at his house on School Street in Mendocino. 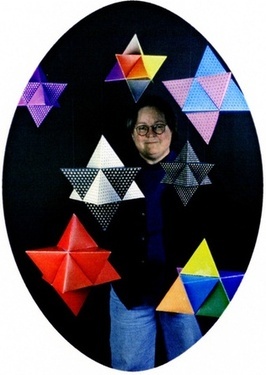 Mendocino artist Pamela Joy Hunter. Photo courtesy of the artist. Charles Marchant Stevenson (1981). Photo by Antonia Lamb. 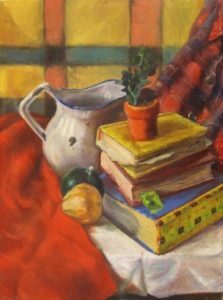 One of Charles Marchant Stevenson’s final gifts is the memory of those special evenings where food and wine were plentiful, young poets and artists shared new work, local musicians performed, and all were welcome. 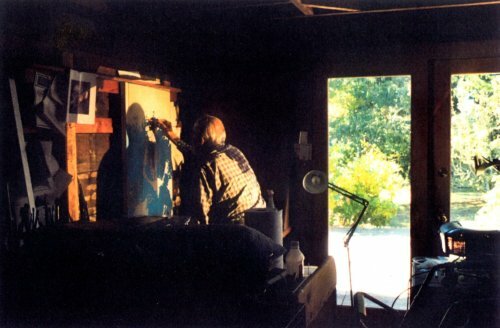 Charles Marchant Stevenson at his easel, working on his Portrait of the Jonas Family, on his last day in his studio (2004). Photo by Antonia Lamb.